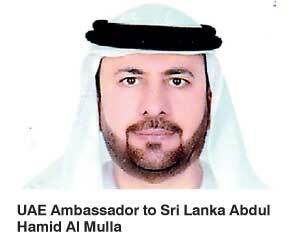 United Arab Emirates (UAE) Ambassador to Sri Lanka Abdul Hamid Al Mulla will be the Special Guest Speaker at the ‘Meet the Ambassador’ program on ‘Bilateral Trade between Sri Lanka and UAE’ on Tuesday 23 May at the National Chamber of Commerce from 3.00 p.m. to 4.30 p.m., No. 450 D.R. Wijewardene Mawatha, Colombo 10. He will be accompanied by the First Secretary of the Embassy. The participants will get an opportunity to interact with the Ambassador and other officials of the embassy and gain information on trade matters with the UAE and services available for Sri Lankans. The UAE consists of seven emirates including Abu Dhabi, Dubai and Sharjah. The capital of the UAE is Abu Dhabi with a population of 5,927,482 (2016.). Its GDP is $ 375.5 billion. Sri Lanka’s main exports to the UAE are tea, apparel, natural rubber, desiccated coconut, copra, cashew nuts, essential oil, fruits and vegetables, processed food, seafood and rubber products. Sri Lanka’s major imports from the UAE are petroleum oils and oils, gold, precious stones, plastics, sugar, aluminium, electronic equipment, machinery, etc. Total trade turnover has been in the range of $ 1.3 billion in the last year. Total trade turnover, which stood at $ 286 million in 2003, has increased to $ 1,347 million in 2015. The UAE is the largest export market for Sri Lankan products and the largest source of imports to Sri Lanka in the gulf region. There are about 15 joint ventures in Sri Lanka with UAE investment; the Galadari Group, Emirates group and Etisalat are major investors from the UAE. The country’s free trade zones, offering 100% foreign ownership and zero taxes, are helping to attract foreign investors. The UAE is the largest Foreign Direct Investor in Sri Lanka and is interested in Sri Lanka’s tourism, education and health sectors and has opened doors to SMEs of both countries and takes part in more and more business forums and exchange trade and business delegations. Sri Lanka and the UAE established diplomatic ties in 1979 and have been enjoying cordial and friendly relations in trade, investment, tourism and economic cooperation over the past several decades. In 30 years, the UAE has undergone an amazing transformation from an impoverished small desert to a modern state-of-the-art nation with high-tech living. For registration for the event contact the Chamber through Mrs. Fouad on 4741788 pa@nationalchamber.lk or nirmani@nationalchamber.lk.